Have you ever been amazed what God is doing in someone else’s life but unable to believe that He could do anything in yours? You can get sidetracked by looking at natural facts instead of looking into the face of Jesus. You can build your faith or tear it down according to what you focus on. Your faith does not add to God’s ability. Your lack of it does not limit it either. Jesus is Almighty God, Advocate, Savior, King of kings and Lord of lords. He can do more than you can ask or imagine. The difference between the faith (or lack of faith) of those in Jesus’ home town and that of the centurion was that the first group never even asked Jesus do something. They rationalized away His power with their knowledge and past experience. The centurion knew how authority worked, looked at what Jesus had done for others and took a risk. 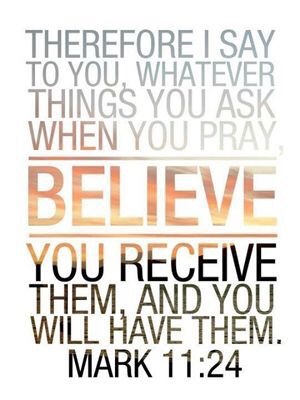 You may be waiting until you have more faith to ask. More faith to act. More faith to risk. More faith to obey but Jesus said it’s not the amount of faith you have, it’s what you do with it. I am not saying I understand it all or have wrapped my brain around it. Great word, Cindy! In the Old Testament their burnt offerings were sweet smelling to the Lord. I say we need to stand, see, and taste that the Lord is good. To drink in His blessings. To get out of the boat, to step into the pool, to mix the natural (sand/spit) with the supernatural. Watch and see what He can do with our little mustard seeds. AMEN Linda! Yes and Amen. Drink in his blessings- yes.